A ‘How To’ Guide for Community Led Organisations and community engagement workers. Launched in September 2016, this guide was written by PB Partners, at the request of the Scottish Government, to support the £2m Community Choices programme. 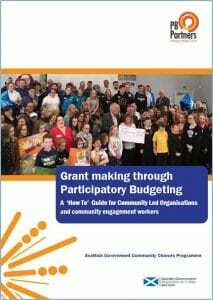 Specifically written with community led organisations in mind but also useful for front line workers or local authorities starting out on using Participatory Budgeting (PB) it condenses PB Partners learning from over 15 years of doing PB in the UK. Whilst there is already a lot of information available on PB, this new guide lays out a simple 10 step process for PB grant making, from forming a planning group right through the monitoring and evaluation. With a range of customisable templates and links to further information.